Think not what NORML can do for you, but what you can do for NORML. Basic Membership includes Membership Card, and newsletter, event invitations. The annual dues for this level of membership are $20. Become a Basic member! 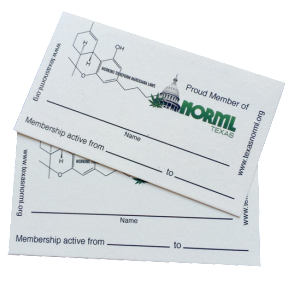 Supporter Membership includes Membership Card, and newsletter, event invitations and a Texas NORML shirt. The annual dues for this level of membership are $35. Become a Supporter! 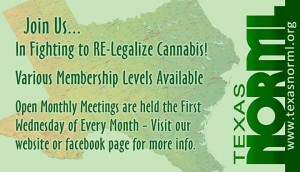 Family Membership includes 2 Membership Cards, Event Invites, 2 Texas NORML Shirts, buttons, and stickers. The annual dues for this level of membership are $70. Get your Family Membership! Freedom Fighter Membership includes Membership Card, event invitations, Texas NORML Shirt, button, sticker, and glass art. The annual dues for this level of membership are $100. Become a Freedom Fighter! Lifetime Membership includes Membership Card, Texas NORML Shirt, button, and sticker, Drug War Facts Book, TX NORML Glass Art & Free Entry to All TX NORML Events for life! One-time membership due for this level of membership is $1,000. Grab your Lifetime Membership!